It’s Monday, which means it’s Racing Monday, Papa Wheelie reviews the season opening race in Melbourne. During my college years (the late 90s), my best friend and roommate used to tease me all the time about F1 results during that era, because you could pretty much guarantee that Michael Schumacher or Mika Hakkinen would either win or be on the podium. He had a good point though that, as soon as someone cracks the formula and builds the great car, they usually will dominate. At first glance, the qualifying and race results reflect pretty much where the teams were last year. 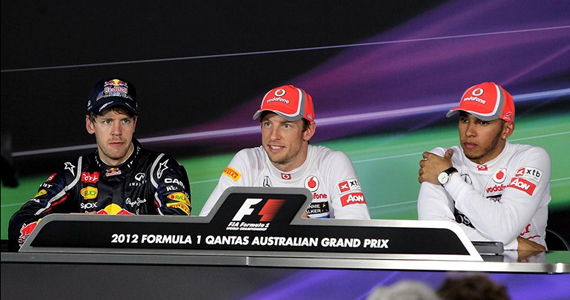 But this is definitely not how the season opener in Melbourne played out at all. Jenson Button had a clear and smooth path, and was never really challenged by anyone. Lewis Hamilton was blindingly quick in qualifying, but was always being hunted by either Michael Schumacher early in the race, or Sebastien Vettel late in the race. Vettel and Mark Webber made decent starts, but ultimately showed why they are the current world champions with Red Bull Racing. They fought hard and made up a lot of ground to finish 2nd and 4th. The rest of the top ten finishers fought equally hard and made up a lot of ground to score the points, especially the Saubers and Fernando Alonso. After looking so promising during pre-season testing and throughout the race weekend, Mercedes have definitely stamped themselves at the front of the grid, even though they’re race results don’t show that at all. Mistakes from Schumacher and Nico Rosberg ultimately cost them valuable early season points. Don’t expect them to take that lightly, as the W03 is the business and will be back next week in Sepang. As the teams stand, Mercedes and McLaren are definitely proving that they found some pretty nice speed with their new cars. Red Bull Racing is up there, but this year is not going to be a cake walk for them, as they didn’t have the sheer speed needed in qualifying. Ferrari did well to claw back some points, and could have easily had a double points finish, if Felipe Massa stayed out of trouble. Kimi Räikönnen drove a terrific and calculated race that earned him 6th, which is realistically where the Lotus seems to be. Sauber is a big story as both cars made the points and Sergio Perez came from dead last to 7th. Daniel Ricciardo and Paul Di Resta round out the points finish midfield for Scuderia Toro Rosso and Force India. Toro Rosso and Force India had a relatively quiet race, with Jean-Eric Vergne and Nico Hulkenberg having relatively underwhelming races, but I’m sure they’ll looking to strike back next week. Pastor Maldonado and Felipe Massa have to be the ones that really lost out the most in Melbourne after being pretty competitive in the midfield battle and in a position to score points. Overall, they lost because of mistakes and contact damage. Williams is definitely capable of running with the midfield now after a disastrous 2011, and could even surprise the front runners if the conditions help them out. Out of the new teams, Marussia were the only ones to finish, as HRT didn’t make the grid by being outside the 107% percent qualifying times, and Caterham retired their cars near the end of the race with steering column issues. Caterham is making progress with their new car, but reliability is always key to any team’s campaign. Biggest chump of the race had to be Schumacher for running so well with the new Mercedes and taking himself out on silly mistake going into turn one, and harming the W03 in the process. After running so well in qualifying, Romain Grosjean was taken out by an aggressive move by Maldonado. He’s showing real promise in coming back to the sport, and if the numbers stick, Grosjean and Lotus can do well in Sepang. The season opener definitely lived up to the hype that was created during the off-season. Also, because of how close all the teams were at the finish of qualifying and the race, this season is shaping up to be a really entertaining one. Just one week to Sepang in Malaysia, where everyone’s cards will be on the table. Torrential rain and tons of action have always been in the books in Sepang, so expect a few more surprises in one week’s time. 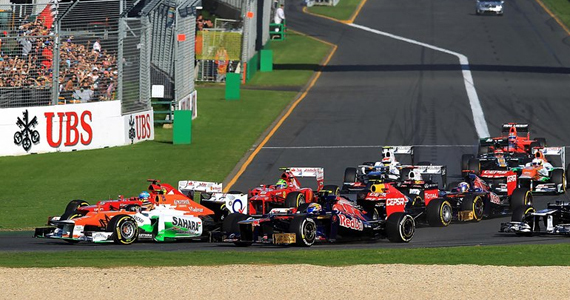 Check out the official site of Formula 1 Racing for full results.